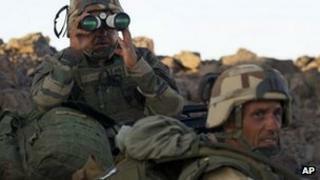 French President Francois Hollande has said his country will begin withdrawing troops from Mali next month. He said the final phase of military intervention would continue throughout March and be scaled down in April. The campaign in the north had killed "terrorist leaders", Mr Hollande said without giving any names. A French soldier and 10 rebels were also killed during the clashes, 60 miles (100km) east of the town of Gao, defence officials said. There have been four French deaths since military operations began on 11 January. Speaking in Warsaw, Mr Hollande said: "The terrorist kingpins have been destroyed," though it was not immediately clear if he was referring to two leaders reported dead last week. Chad had said its soldiers, fighting alongside the French troops, killed two top militant commanders, Abdelhamid Abou Zeid from al-Qaeda in the Islamic Maghreb, and veteran Islamist leader Mokhtar Belmokhtar. The French have so far not confirmed these reports. Some 4,000 French troops are present in the West African state. France had initially said that troop numbers would decrease from March if all went according to plan. On Wednesday, Mr Hollande said that the "final phase" of the French intervention "will last through March and from April there will be a decrease in the number of French soldiers in Mali as African forces will take over, supported by the Europeans". France intervened militarily in January amid fears the rebels were preparing to advance on Bamako.